With the summer season heating up, these charming cottages will have you feeling a different type of cabin fever. 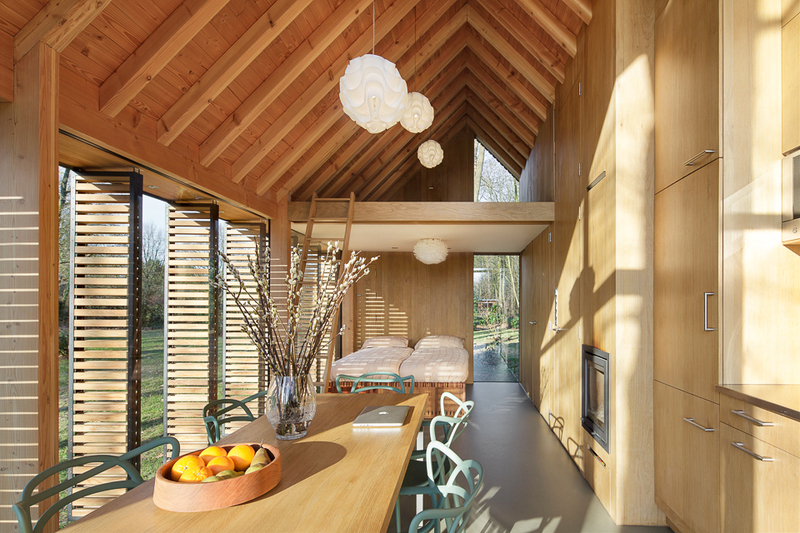 This sunny Dutch cabin's open plan is neatly divided into public and private spaces, with the front containing the kitchen and living areas and the back holding the bedroom and bath, overhung by a small mezzanine. A hidden wooden panel can be drawn closed between the two sections for greater privacy. On the banks of Lake Superior's Madeline Island, this 1,600-square-feet open-plan cabin features a screened porch, traditional porcelain fixtures, and shed door latches. To make it to this remote site, every piece of the prefab structure had to be carried by ferry across the lake. In Washington's Cascade Mountains, Balance Associates designed an 850-square-foot cabin that stands up to the region's tempermental climate, where conditions can range from 30 degrees below zero with three to four feet of snow in winter to up to 110 degrees and dry in summer. This family retreat abuts a rocky cliff in Herfell, Norway. The central cabin provides communal living spaces, while the two cabins that flank it are used as private sleeping quarters. Architect Greg Dutton designed this 900-square-foot cabin as a birthday present for his father. The Appalachian retreat is completely off the grid thanks to passive orientation and a solar array. In Norway, architect Marianne Borge packed (almost) everything that up to six vacationers could need into the Woody35, a prefab package that's just under 400 square feet. You'll have to head outside for a shower though.